Franklin City Schools Superintendent Arnol Elam has taken the outrageous step of enlisting his students to further a political agenda to unseat Governor John Kasich in the next election. In a letter sent home in kid’s backpacks, Elam calls for parents to join him in “an active campaign” to oppose Governor Kasich, involuntarily conscripting public school children to become political volunteers against the Governor. “As parents and friends of our district, I hope you will do two things: First, please join me in an active campaign to ensure that Gov. Kasich and any legislator who supports him are not re-elected, ” he writes. Elam even posted the political letter to the district’s website. 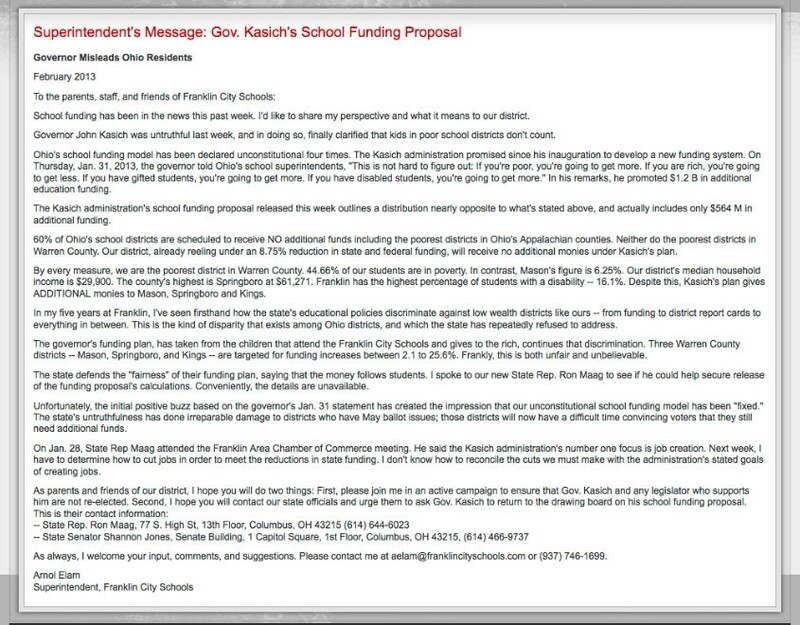 Again, this is a letter sent in kids’ backpacks and posted to a public school district website (see screenshot here). Not surprisingly, Stephen Dyer and the liberals at Innovation Ohio are supporting Elam and his use of state resources for political gain. As if that wasn’t enough, the letter’s assertions just aren’t true. The real truth is, low-wealth districts will receive much more state aid than high-wealth districts. Under Governor Kasich’s new school funding plan Ohio’s low-wealth and urban school districts receive more state aid than high wealth districts both as a portion of Ohio’s overall formula funding and also on a per-pupil basis. In fiscal year 2014, Ohio’s lowest-wealth districts would receive 155 precent of the state average per-pupil and 400 percent more than the highest-wealth districts. Ohio’s wealthiest school district by property value would receive just $110 per-pupil, while Ohio’s poorest district, Trumble Local in Athens County, would receive $7,678 per pupil in state aid. $7,678 – that’s more per pupil than the 28 richest school districts – combined. The change being made here is that Governor Kasich’s new plan prioritizes the students, rather than the bureaucracy. Many districts which, because of shrinking student numbers and rising property values, would have lost state formula aid will instead receive no less funds than they received last year. Every school district in Ohio will receive at least as much state aid as they did last year. State funding for education has increased each year since Governor Kasich took office, where state funding is Department of Education state general revenue fund excluding property tax relief and lottery. For fiscal year 2015, funding levels exceed fiscal year 2011 actual spending by $1.18 billion. But these truths only serve as inconveniences to Superintendent Elam, Innovation Ohio and the ODP. Superintendent Elam can be reached at [email protected] or (937) 746-1699. Frankin City School Board President JoAnn Feltner can be reached at [email protected] or (937) 746-8583. The other board members’ contact information can be found here.